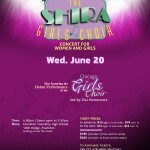 Shira Girls Choir coming to Chicago for the very first time tomorrow night! songs from their other albums “Yisimeich Elokim” and “Lechu V’nailcha”. Shira Girls Choir concerts are known for their dynamic singing, flawless choreography and astounding costumes. The show will also feature the Chicago Girls Choir under the direction of Zisi Pomerantz. Tickets are $10 for students and $18 for adults. what is sure to be an unforgettable and enjoyable evening and help support Madraigos at the same time!